Our drive from Limon, CO to Salinas, KS was VERY windy. There were gusts up to 35 mph, but the wind didn’t try to push us off the road. That was something I was very scared of when driving a trailer, but we had no problems with that. Our gas mileage never got over 25 mpg because of that wind, however, bringing our average down to 29 mpg. 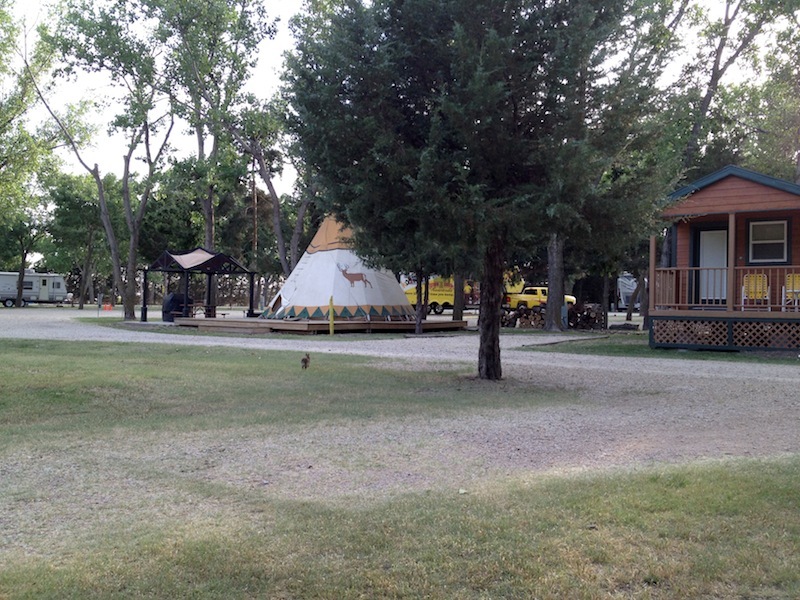 We had an easy day of driving and ended up at the Salina, Kansas KOA Campground. 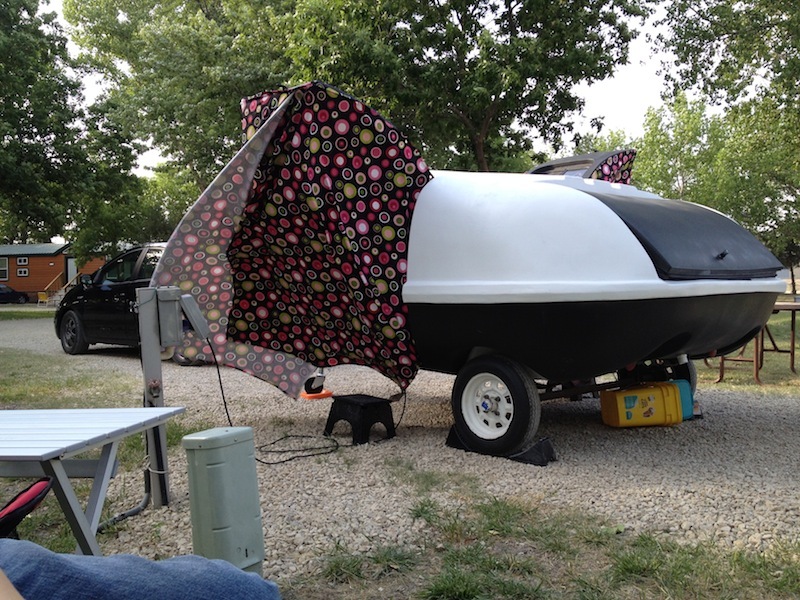 It was our first stay at a KOA Campground and it was a pleasant surprise. I think I felt so welcome because the girl who checked us in said, “Grandma is going to show you to your campsite.” She pointed at a white-haired lady, who lead us to the golf carts. We followed her to our site and I felt like we were in a four-star hotel. We’ve camped in National and State Parks for years and never once have we been lead to our site. We’ve always just struggled through on our own, mostly without even a map. The wind was still gusting and even though I had made some alterations to our awnings, they still blew in the wind. There was a resident bunny. It was very difficult to get a picture of him because he was so shy. 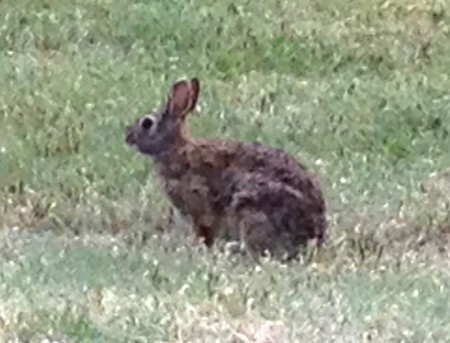 Seconds after that photo was taken, the bunny ran off. You can see him in the distance in the next photo. They also had a fishing pond out back, cabins and even a large teepee. We had a lot of people come by, asking about the trailer and whether we sleep in it or if it’s just for gear. 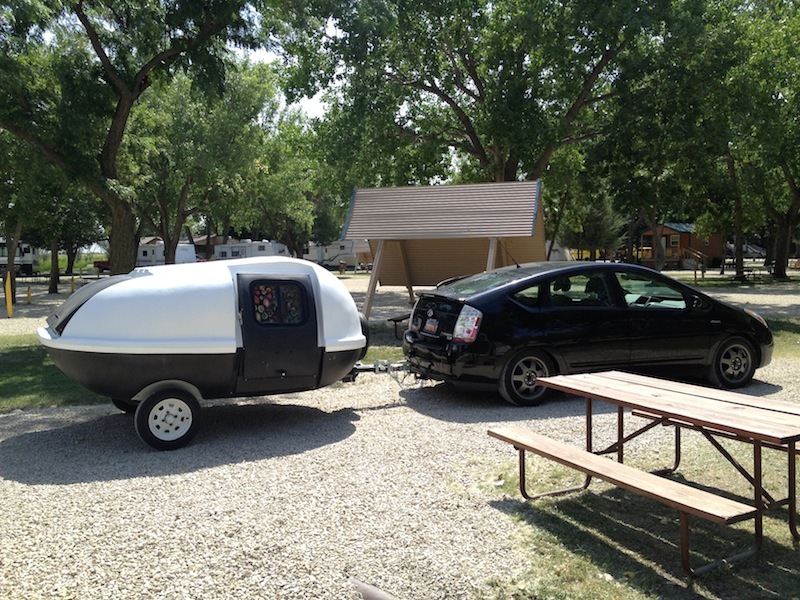 It was a lot of fun showing the teardrop off to everyone who came by. The bathrooms were spotless and the museum across the street was interesting (they had an old Philco Predicta TV in their exhibit). The only negative to the site was the freeway noise since they were right by the busy road. Other than that, we loved our stay there.